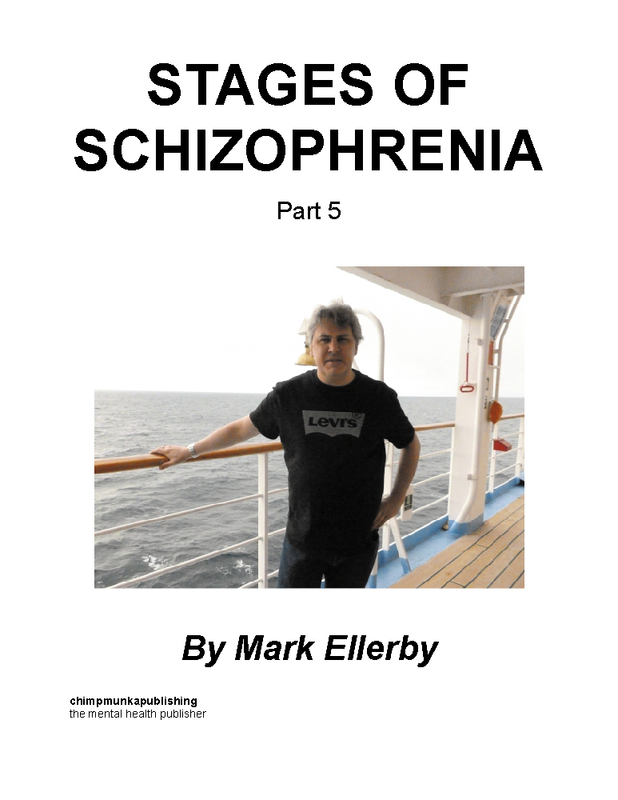 This, Mark Ellerby's fifth book in the series 'Stages of Schizophrenia', deals further with his experiences of and thoughts on living with schizophrenia. This book explores some very important and pressing issues and in doing so debunks some myths and exposes many truths. Mark is an entertaining and informative writer and this is a worthy addition to his previous works. After getting off to sleep easier and getting out and about more a further opportunity to overcome some more aspects of the illness presented themselves. I realise that during a lot of the therapies that had preoccupied most of my time I was overlooking some of the more obvious problems with the illness which I had forgotten about: that of going into shock. At other times found it hard to practice the breathing exercises because what also became visible when trying to sleep that I had a tight chest. The illness causes me to be uptight much of the time but it was the going into shock this way that caused much of the problem here. My initial thoughts were that being schizophrenic If I came out of shock I would then go straight back into it and life would be a constantly struggle coming in and out of it. I was taught to jolt myself back by the cognitive behavioural therapist and to practice this a few times each day. Would it work? I had mixed feelings about this? I remembered that once, with vivid clarity, that I was responsible for 9/11 and this put me deeper into shock. I felt I was so far into shock that I would never come out? So the worst point came with the panic attacks. These were brought on by a sudden vivid realisation from my delusions. At other times when out and about I survived the panic attacks and didnt rush back to somewhere safe. Again I wondered about coming out of shock but didnt feel I would be strong enough to keep doing it. An alternate strategy was need to come down and become stronger first. Then I would seize the opportunity to be more myself again. Being in shock is the bodies way of protecting you against system overload. It was this protection that I relied upon not to face the full impact of the schizophrenia. Bringing myself back would have opened me up to much nervous trauma which would be visible to other people when out and about. Staying in shock however was a very good way of hiding all of this because the shocked state is not visible to other people and allowed me to be much more functional. That in turn led to another problem of how to build my strength up first and as I described in my book Schizophrenia and anxiety some graded exposure was helpful in this. The usual breathing exercises were recommended, as they always are, but I was lucky to find a new and lesser known therapy to help with this and I think it a good idea to publicise it. Developing compassion is a way of soothing the fear caused by schizophrenia and of building strength which is powerful enough to bring me back from the shock state and not to go back into it. It is not about trying to overcome the fear but to make the burden of it easier, to lighten the load if you like. There would then be enough strength here to cope with the symptoms and stop the over load effect. The therapeutic process has been lengthy and has in my case lasted over two years but the effects are more powerful even than the normal breathing exercises. In my case I am looking forward to the day when I do come out of shock as I can barely remember the time before it and how it feels in the body. Developing and understanding compassion can be a lengthy process so I am not able to end this essay with a eureka description of what it feels like but only to note when it happens I will describe it elsewhere.